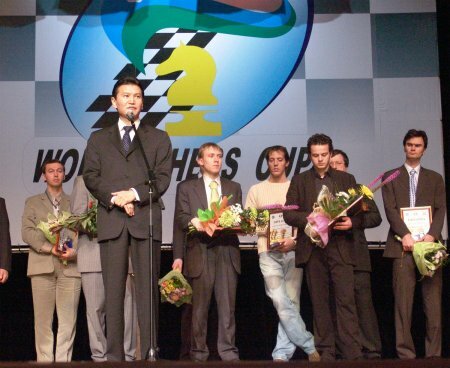 World Chess Cup 2005, Khanty-Mansiysk, Russia. News: Kirsan Ilyumzhinov: Bravo, Ugra! And thank you for everything! 22.12.2005 Kirsan Ilyumzhinov: Bravo, Ugra! And thank you for everything! On behalf of the World Chess Federation, I am very happy to welcome the winner of one of the year’s most prestigious tournaments – World Chess Cup – Levon Aronian. Levon with his creative and inspiring games during this knockout marathon has gained the admiration of dozens of millions of the fans from the whole world, who have been following this tournament with the help of mass media and the Internet. I am confident that this wonderful Armenian sportsman is also a favorite of the local chess lovers. I have no doubt that his example will become a worthy model to be followed by hundreds of local children who dream of big sporting success. When I announced that the next World Chess Cup would be taking place in Khanty-Mansiysk, many skeptics expressed their doubt whether Ugra, with no experience at all in the organization of such large chess forums, will succeed to organize this event on a high level. These people have been totally defeated: the World Chess Cup turned out to be organized brilliantly. I managed to get the opinions of many chess players: all of them expressed their admiration of Khanty-Mansiysk and the way they were treated. Bravo, Khanty-Mansiysk! It is a pleasure for me to thank most cordially my friend, the Governor of Yugra – Alexander Filipenko. Unfortunately, due to my busy schedule, I could not stay in the venue during the whole tournament. But being in Moscow, Elista and any other place of the planet, which I had to visit during these days, I have felt a close interest to the battles in Khanty-Mansiysk. I was approached by a large scale of people, from businessmen to simple farmers, who were asking me to give them the latest on the World Cup.I would like to give you this simple example: a number of daily visits to the tournament’s site were 70000 people from more than 50 countries of the world! And this is data just from the official site. Millions of people from all the continents have learnt about Khanty-Mansiysk during these days. And this is first of all thanks to the Governor Mr. Filipenko. Bravo, Governor! I am also expressing our gratitude to all those who contributed to the preparation and organization of this tournament – the Government of the Khanty-Mansiysk Autonomous Region – Ugra, sponsors, the Organizing Committee, local chess federation, and the mass media representatives. You have made this event unforgettable for all of us. The chess players have already requested to organize tournaments in Khanty-Mansiysk on a regular basis. We have discussed this issue with Mr. Filipenko and I am sure that in the nearest future we will be in a position to have some pleasant news for you. Now I just can promise you that Khanty-Mansiysk will most likely be the venue of the future greatest chess forums. Bravo, Ugra! And thank you for everything!